In the new year, author lian goodall will be teaching a new general interest Creative Writing/ Children’s Book course for the York Region District School Board, Continuing Education. Classes will be held at Huron Heights Secondary School, 40 Huron Heights Dr., Newmarket, beginning January 24 on Wednesdays from 7 p.m. to 9:30 p.m. The course lasts 8 weeks and costs $110. To register or for more information contact Site Supervisor Gisella Linney at (905) 884-3434 ex 931 or 1-877-280-8180 ex. 931. 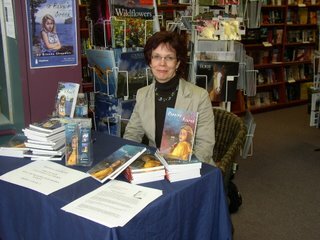 On Saturday, December 2nd, Brenda Chapman signed books at Shirley Leishman bookstore, Ottawa, Ontario. Photo by Katherine Hobbs, Capital Crime Writers. On Tuesday December 5, 2006, Napoleon author Heather Kirk will be at the Barrie Chapters store from 6 to 9 p.m. She is helping to raise money for the library of Central Collegiate in Barrie.